Corporations fear Amazon. They should. That’s because the online pioneer thrives on disruption. It often steamrolls over its wide-eyed competitors. 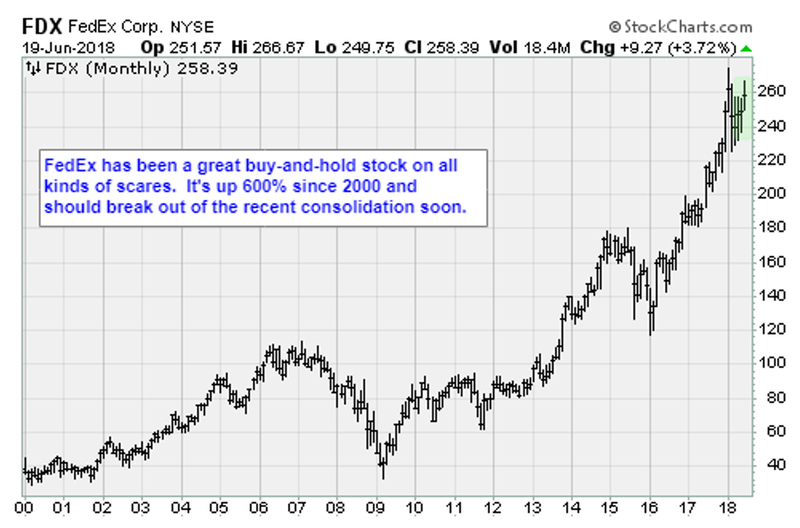 Just look at what happened to FedEx Corp. (FDX). In February, FedEx shares collapsed following a Wall Street Journal report that Amazon was about to launch a delivery service for businesses. Shipping with Amazon, the moniker for the new service, was supposed to kill incumbents. 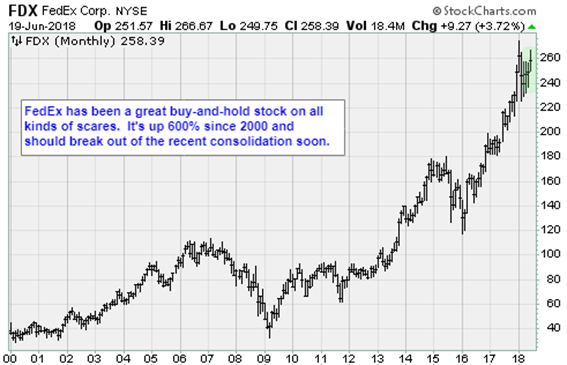 Smart investors saw opportunity. Not (just) to buy Amazon, but to pick up FedEx shares on sale. Everyone knows Amazon is innovative. Its leader, Jeff Bezos, is a hard-working visionary. The company has amassed an arsenal of cutting-edge tools, like cloud computing. And it employs legions of engineers who use artificial intelligence to disrupt many new business segments. That alone should keep lesser competitors awake at night. But FedEx is not a lesser competitor. The Tennessee company transformed logistics with a centralized, online computer system in 1979. Four years later, it reached $1 billion in sales. In 2004, the company was already fiddling with hybrid-electric trucks. All-electric delivery vans followed in 2010. FedEx has always been one step ahead. And its Purple Promise employee pledge has led to best-in-class customer service for decades. After the closing bell Tuesday, FedEx reported fourth-quarter and full-year financial results for fiscal 2018. The numbers were spectacular, again. Revenue in the quarter rose 10.2%, year-over-year, to $17.3 billion. Full-year sales came-in at $65.5 billion, with 7.4% operating margins. Managers forecast 9% revenue growth in 2019 on higher package volume. So much for death by Amazon. It’s a lesson for investors. Seeing everything in terms of a zero-sum game often means you miss the larger trend. To be sure, Amazon is a mighty competitor. But that is not the story investors should focus on. More shoppers are buying products online. This creates more package volume for all logistics companies. The size of the market is expanding. Many companies are winning. In 2016, eMarketer, a respected digital market research company, predicted worldwide online sales will reach $4 trillion by 2020. That’s up from only $1.9 trillion in 2016. More important, online shopping is steadily rising as a percentage of overall sales. 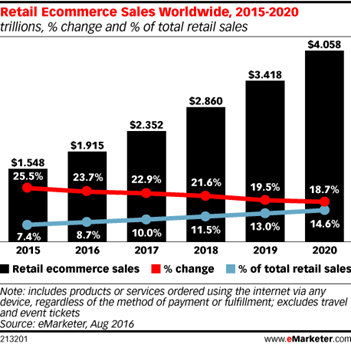 By 2020, eMarketer expects online sales will comprise 14.6% of a predicted $27.7 trillion worldwide spend. Like most well-managed companies, FedEx managers saw this coming long ago. They have been building scale ever since. It’s why the company started its digital transformation decades ago with waybills and massive automation. In 2011, its Maryland sorting facility was processing 3.5 million packages per day without human intervention. It’s why FedEx continues to gobble up market share by buying competitors. In 2015, it added TNT Express for $4.8 billion. And the company is not relenting. FedEx continues to invest heavily in next-generation technology. While Amazon sees a future in autonomous drones as package deliverers, FedEx is more focused on utilitarian robotic vehicles that fit its existing architecture. Tuggers move furniture and other bulky items around the FedEx Ground Greensboro, N.C. Watch on YouTube here. It’s working with Peloton Technology, a Mountain View, Calif., company that develop of autonomous truck platoons. The idea is to link several large trucks together through vehicle-to-vehicle communication networks. The trucks follow more closely, which reduces wind resistance — saving energy and slashing costs. 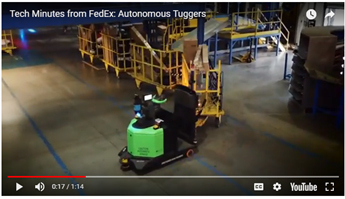 Inside FedEx facilities, the company is experimenting with robotic tuggers. These small machines work next to humans in North Carolina to autonomously pull trailers with bulky items that don’t fit on conveyor belts. All the while, a single engineer observes from the control room. All these projects fit into a larger technology program that is renowned for reducing costs and improving productivity. It is what great businesses do: They leverage strengths to build even greater competitive advantages. The company is also relatively inexpensive. The current price-earnings multiple is 23x. And shares trade at less than one times sales. With a market capitalization of $70 billion, the business is still valued less than United Parcel Services (UPS), a business that’s growing much slower. I believe FedEx has the best business in global logistics. That sector is growing strongly, and more strength is in the pipeline. Occasionally, the shares go on sale due to unwarranted fears of disruption. FedEx is the sector disruptor. These periods of weakness are buying opportunities. Remember that the next time you read a scaremonger headline. P.S. Join me on the 31st Forbes Cruise for Investors! Several recognized experts with proven track records will effectively present the theories behind our strategies in a compelling way, and translate our keen insights into actionable stock recommendations for any market environment. The Forbes Cruise for Investors sails from Rio de Janeiro to Buenos Aires, January 24 – February 3, 2019. Click here for more information. Hope to see you there!